In case you haven’t already seen, check out the NY Times! 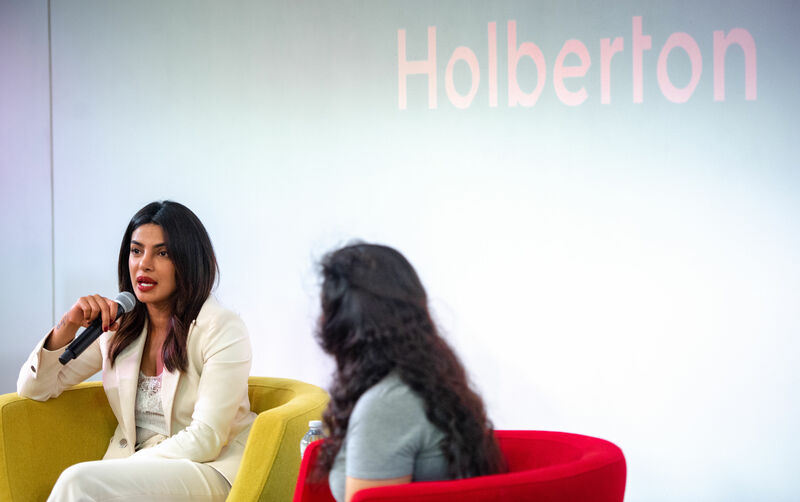 Actor, producer and social activist, Priyanka Chopra, has joined our Board of Trustees and invested in the school – to take an active role in attracting women to software engineering. Priyanka joins our amazing collective of Trustees which includes Grammy winner, NE-YO, Jocelyn DeGance Graham, CEO at CloudNOW, Stephane Kasriel, CEO at Upwork, and Solomon Hykes, co-founder at Docker. Priyanka will work with us on making sure that our mission of providing high-quality education for the many is fulfilled. She will focus on accessibility, and more specifically inspiring more women into a tech career. In the US, only 20% of software engineering positions are filled by women. As software and artificial intelligence are becoming, by the second, a bigger part of how our world works, it is essential to have gender parity in the teams that are building the product and systems that are impacting our society and life at large. We at Holberton have been training the next generation of software engineers, and many are women already working in the field: from hunting asteroids at NASA, contributing to the future of self-driving cars at Tesla and building technology that will power artificial intelligence at Nvidia. Priyanka has been an outspoken advocate, and role model, for women for many years and we are thrilled to align our values and actions to solve the diversity gap in the Tech industry.